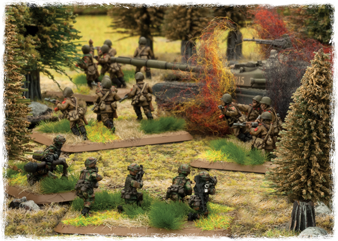 Battlefront, famed for their award-winning game Flames Of War, is about to release Team Yankee, a game set in 1985 as the Soviet Union opens the Third World War by invading West Germany. Designer Phil Yates tells us about this new game. The idea for the game began a few years ago when Harold, a Flames Of War player, sent Battlefront a autographed copy of Team Yankee. At the time our response was ‘We have to do this sometime’, and that sometime has turned into now. The design goals for Team Yankee were pretty straight forward. We wanted to fit everything you need, including the entire rulebook, plenty of background, and complete US and Soviet forces and scenarios from the novel, in a 120-page hardback book. We wanted to keep the depth and complexity that made Flames Of War so popular, but make the game simpler to learn. We wanted the game to be robust enough for tournament play, but have as few special rules and exceptions as possible to keep it accessible to casual players. 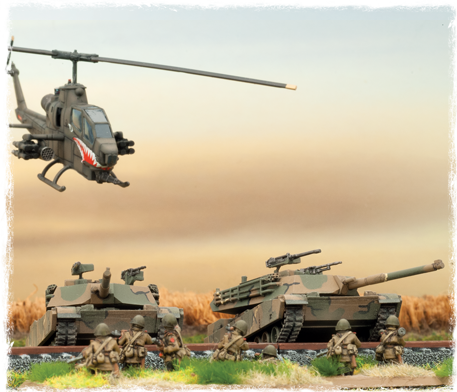 Finally, we wanted to make sure that we would have excellent plastic kits for the key tanks and helicopters. I view Team Yankee as Flames Of War written by a 15-years-older me, with the experience of the Dust Battlefield project under my belt. As such, it has the range, depth, and complexity of Flames Of War, but with every decision revisited, all extraneous rules dropped, and as many as possible simplified. A good example of that would be hit allocation – down from four pages to one, yet working better and far easier to understand. Team Yankee draws a lot from Flames Of War, but most definitely isn’t the same game. 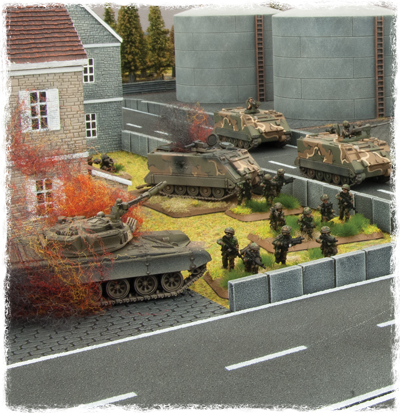 We approached the design as a new game that made the most of our extensive experience with Flames Of War. Overall, it is very similar, but it also has a large number of differences, so Flames Of War players should approach it as a new game rather than assuming they know how it works. Fortunately, the book is pretty short, so it shouldn’t be hard to learn. Another major change is that Team Yankee doesn’t attempt to answer every question. It just states the rules. We will be accompanying the book with a living on-line document that bridges the gap between this brevity and simplicity and Flames Of War’s completeness. This will be a comprehensive Q&A with lots of examples and diagrams to carry the rules into the competitive tournament scene with minimal drama. 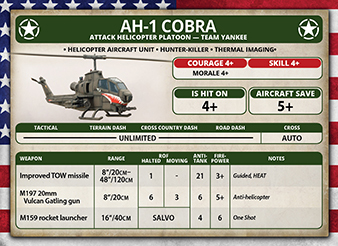 Team Yankee uses a card-based approach to minimise special rules, while bringing much more individuality to the models in the game. 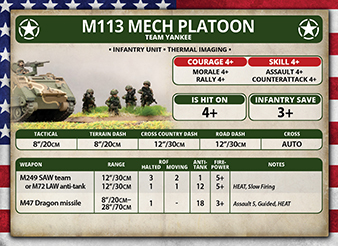 Each unit has its own card showing its game statistics, and on the reverse, the organisation and points for the unit. The statistics are shown numerically, so we no longer have the complexity of something being rated as Confident Veteran with the Guards, Woodsmen, Assault Troops, and Protected Ammo special rules, all of which modify the score needed in different situations. 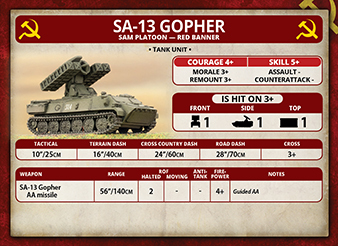 Instead, the unit simply has a target number shown for Courage, Morale, Counterattack, Rally and Remount incorporating all of the modifiers from this sort of rules. In a similar manner, movement is also simpler, but more nuanced. A tank is no longer a Light Tank with Wide Tracks and Unreliable. Now its movement speed in each situation is listed, along with its ability to cross terrain. These cards will also allow us to make new forces without having to repeat many pages of organisations and characteristics that players have seen before. A book can introduce the new equipment and units in a detailed spotlight, while referring players to existing cards for the common items carried over from previous books. Players will get much more flavour in the forthcoming books, but packed into a lot fewer pages. Oh, and one last thing on the cards. You’ll notice that the points are much lower than Flames Of War. Back in 2001, Games Workshop’s 1500-points was the model to follow. These days, games have much smaller totals: 4 points, 30 points, or 100 points. Team Yankee follows that lead with a 100-point game being the ‘standard’ for a quick evening’s gaming. Team Yankee plays very fast, even compared to Flames Of War. There are three reasons for this. The first is movement. 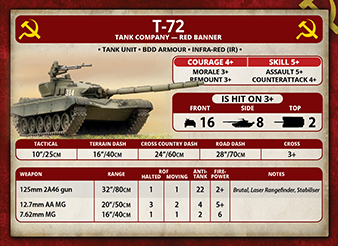 Tactical movement, the speed you go when fighting, is slightly faster for infantry and slightly slower for tanks, but Dash movement is much faster than Flames Of War – and has no penalty other than not fighting. As a result, there is a lot of fast manoeuvre at the start of the game and openings that develop as the game progresses are exploited quickly. The second reason is that the rules are streamlined and simple. They are easy to remember and apply, with most of the information you need on the reference cards,so things just go faster. The third reason is that modern equipment is exceedingly fast and deadly! Other than the speed though, it plays much like Flames Of War. Yep, if you are a long-time Flames Of War player, I’ve probably gone and bolloxed up your favourite game, but that’s not the point. Look at this as a new game set in an exciting new period. A chance to take your gaming in a new direction. Try it out and let me know what you think on the forum at www.Team-Yankee.com. If you are new to Battlefront’s games, I hope you’ll try it. It’s a bit different, but like Green Eggs and Ham, well worth a taste! As it has been out of print for some time and can be very hard to get Harold Coyle’s novel has been updated and refreshed, and will be available on Kindle and in print as part of the release of Team Yankee. I’ve talked about the game, you can see the amazing models in the photos, so what about those cards? The back of the card tells you how the unit is structured, how many points it will cost you, and any special rules it has. Force and formation cards tell you how your units are grouped together. Between all of these cards and the quick reference sheet at the back of the book, you won’t need to refer to the rulebook during play unless you come up with a tricky situation..